I usually use sc for tallying my home finances, but now I’m wondering if that’s the best option. Here’s tapecalc. Ideally, tapecalc works like a traditional paper-tape calculator, like you used in your business classes in secondary school, years ago. Even the display seems to mimic the paper roll effect. tapecalc can save “tapes” as plain text files, and read them back as source files or as annexations. You can save out your “tape,” add on regular “tapes,” and generally edit or juggle to your heart’s desire. And tapecalc is not limited to adding and subtracting; there are provisions for multiplying and dividing, as well as more complicated mathematical adventures. I like tapecalc — a lot. I expect this will take over from sc … as soon as I get tapecalc to run in Arch. 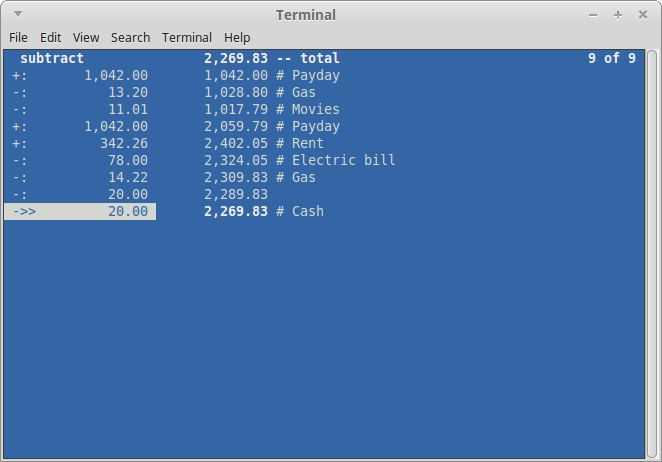 I only found tapecalc in Debian, although I don’t believe it will take much to build it elsewhere. For all the points listed earlier this week, and for a unique take on the traditional console calculator, I’m willing to pass out a third gold star this week: ⭐ Three in a week! Another precedent broken! This entry was posted in Linux and tagged accounting, calculator, finance, home on 2015/01/22 by K.Mandla. Running Arch. Extracted from source file after download. Compiled just fine using gcc. Run “add” in terminal to start. Recommend reading help file from website for usage tips. Ty for this. Been looking for a while now.